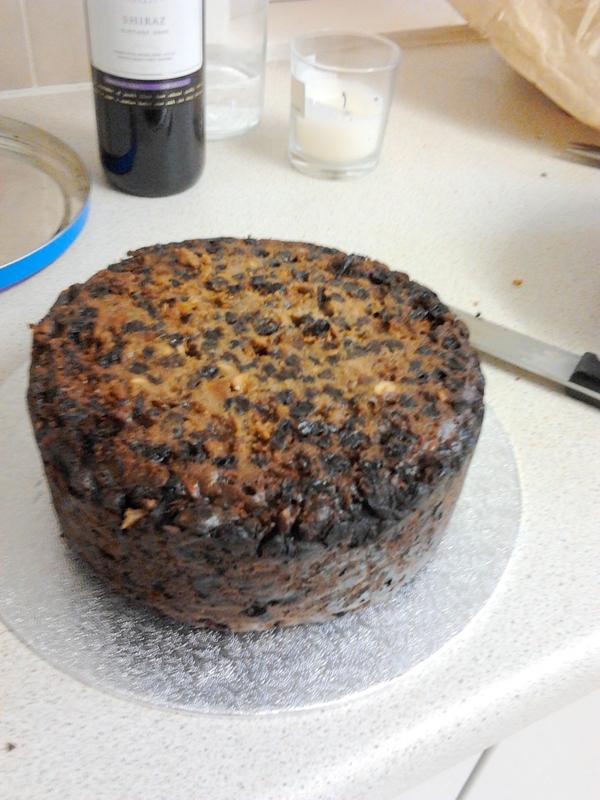 My Christmas cake this year was, again, made using Delia’s classic recipe. This version has pictures for every step, which is really useful. 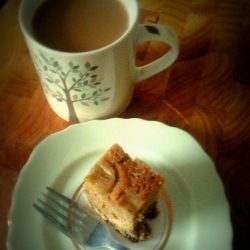 It makes a rich, moist, but not too crumbly cake. I’ll just share a few extra tips and show you how I decorated it. 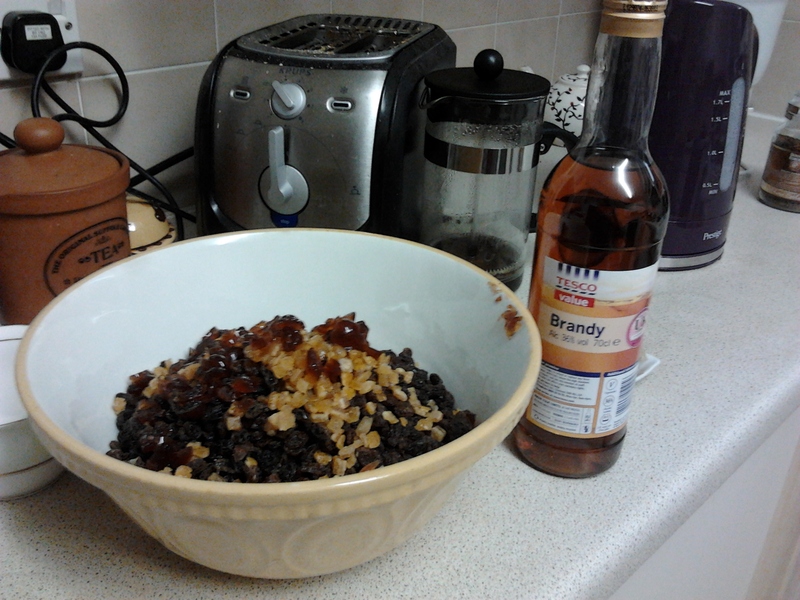 I then fed the cake with brandy at intervals. 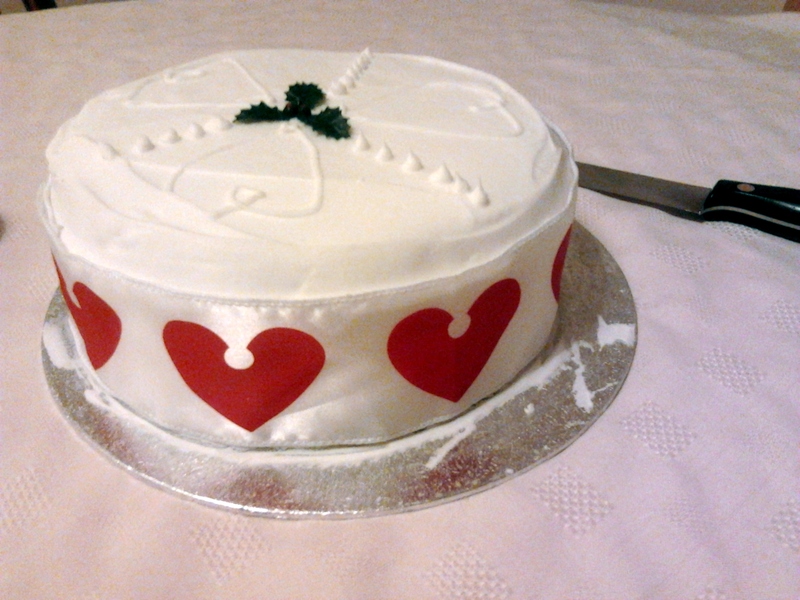 Then marzipanned it and iced with royal icing. You need to put on the marzipan at least 24 hours before icing to leave time to dry, and royal icing needs a while to set too. 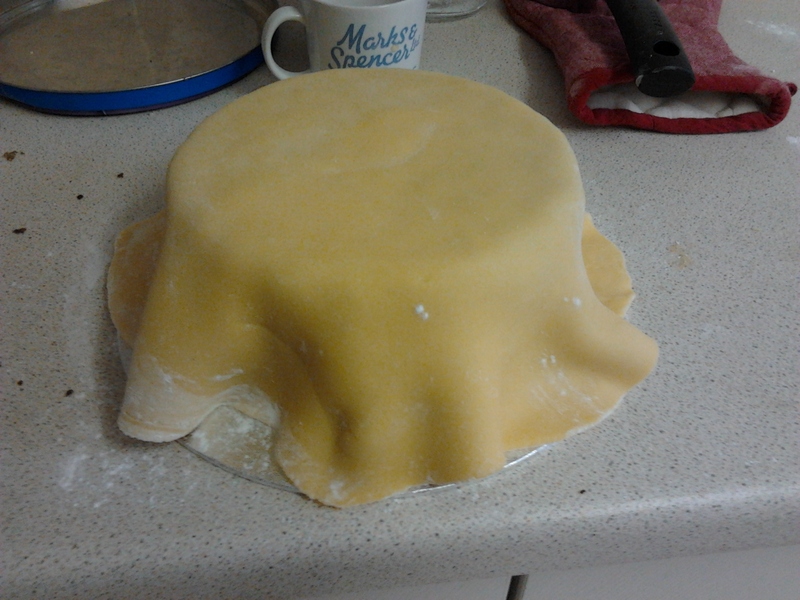 So I marzipanned on the 22nd and iced on Christmas Eve. 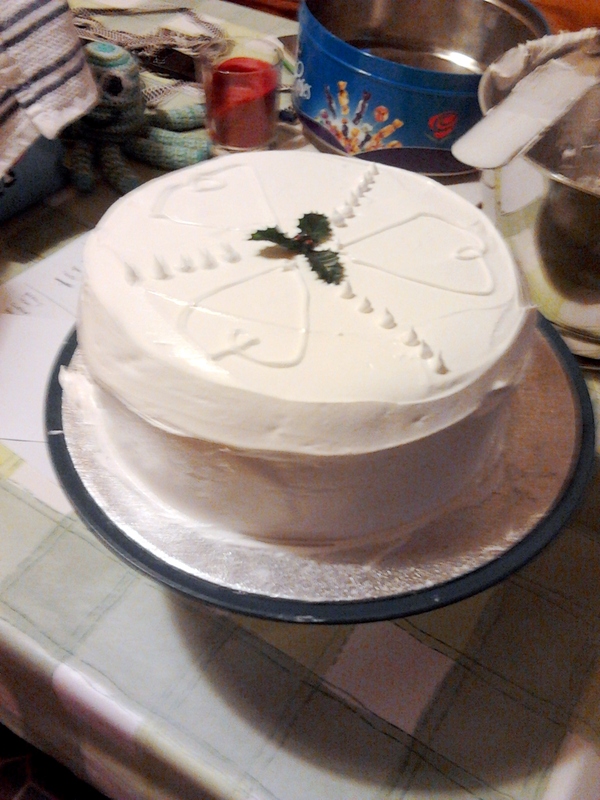 Cut any dome off the top of the cake and place cut side down on a cake board. Cover cake with warmed apricot jam. This helps the marzipan stick on. You use apricot because it’s pretty flavourless. 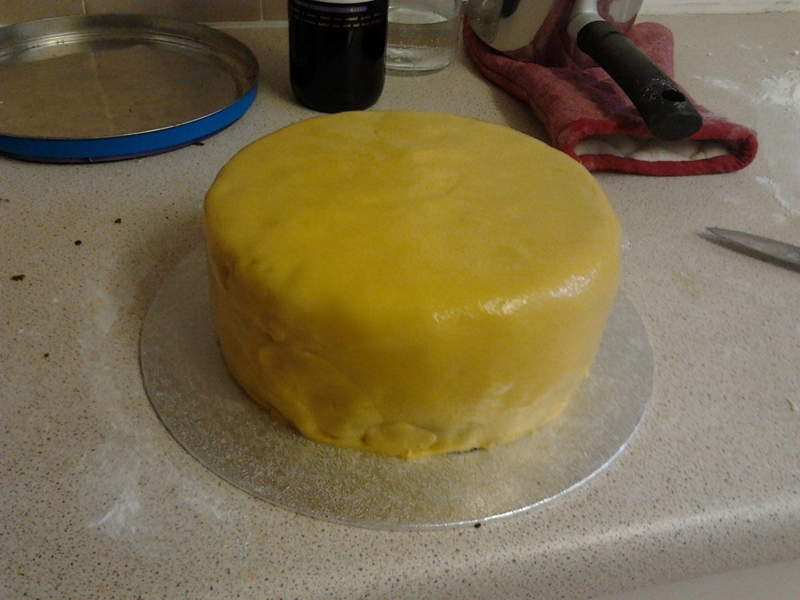 Roll out marzipan (dust the surface with icing sugar first) and drape over cake. Smooth over and trim. You can patch up any holes. It doesn’t matter what it looks like because you’re going to ice over it. 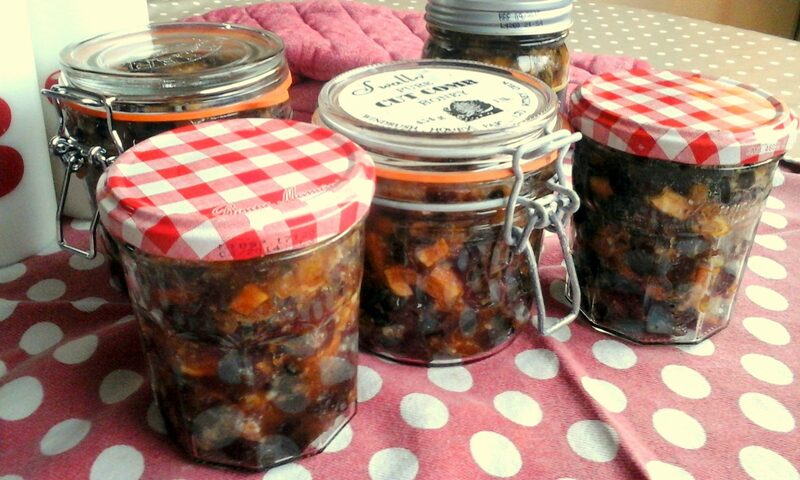 Brush with brandy and leave to dry. 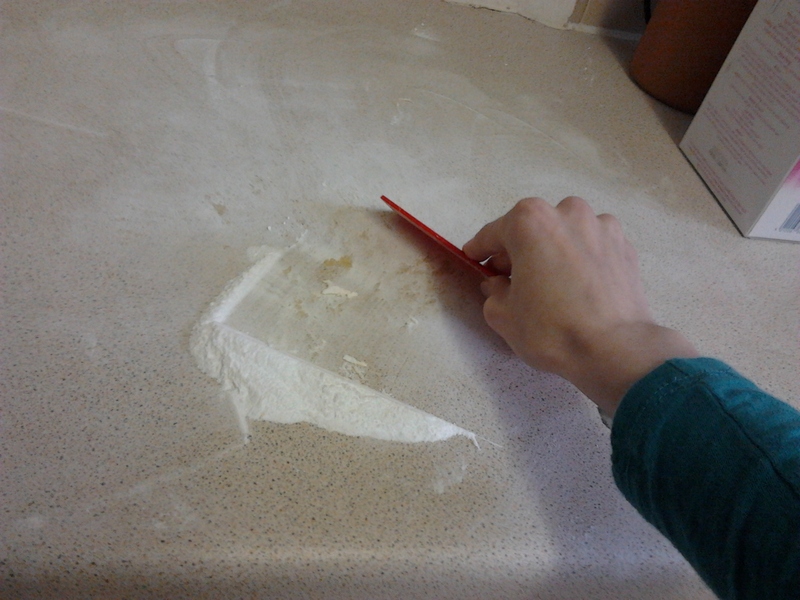 Now clean your worksurface. Lorraine uses a scraper, which also has measurements on it and can double as a kitchen ruler. I just use my kitchen ruler. I used royal icing which I made by beating 3 egg whites with 500g icing sugar for about 10 minutes until it stands up in stiff peaks. 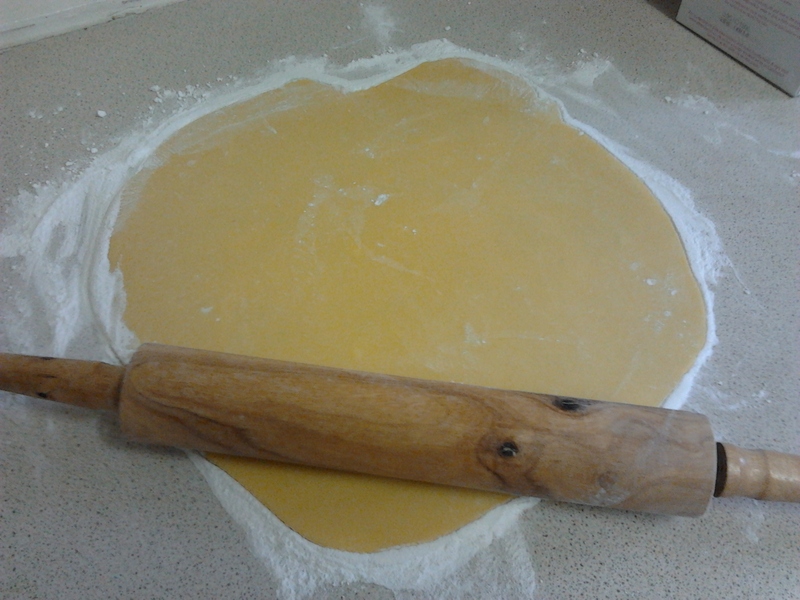 Then beat in 3 tsps lemon juice and 1tsp glycerine. 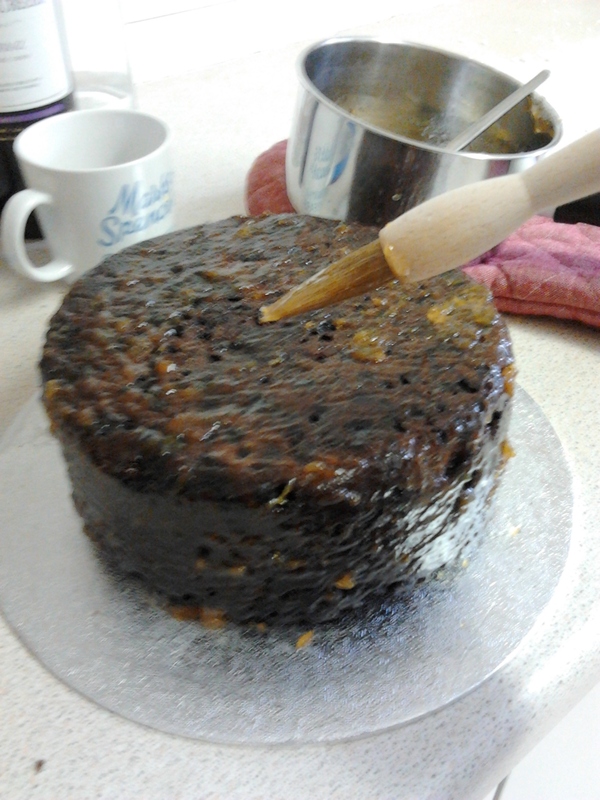 I gave the cake a smooth coating of icing, using my makeshift turntable (plate on upturned bowl) and a palette knife. Then I piped some patterns on the top. 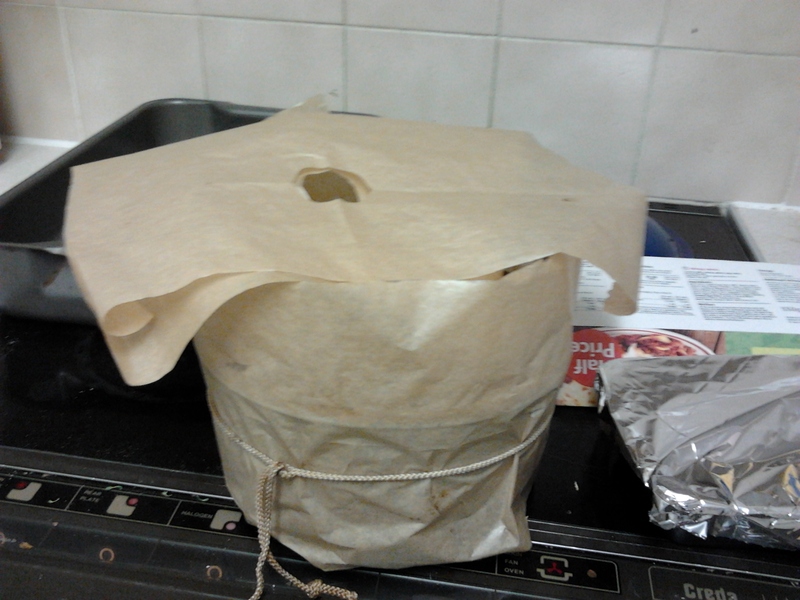 You can use a disposable piping bag, but Lorraine prefers to make her own from paper. Well goody for her, I used a disposable plastic one. 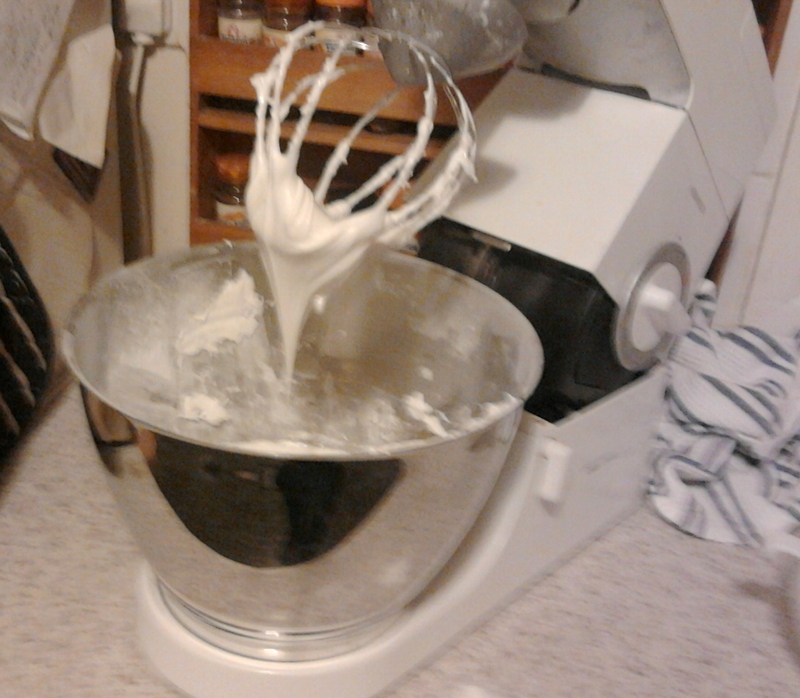 I kept back a small bit of icing in a plastic bag (see below).